A 34 year old man from Elk Creek, Virginia died on October 8,1999 after being burned in a gas fire. Ernest Wade Osborne an employee for the Flying J Travel Plaza was attempting to change a gas pump filter. The Wythe County Sheriff's Office reported that Osborne was unscrewing the filter, when gasoline sprayed out and was ignited by a camper next to the pump. When the Fire Department arrived the camper was fully engulfed. Dave Lamport, the owner of the camper, pulled up to the pump in front of Osborne when the fire ignited. Mr. Lamport refused treatment at the scene after cutting his hand in an unsuccessful attempt to unhitch the camper from the truck. 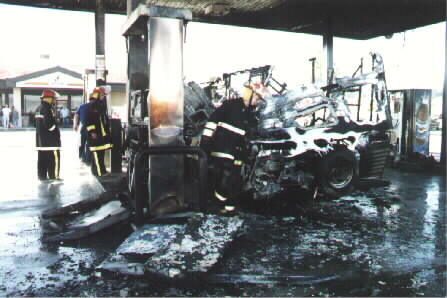 According to initial estimates, the fire caused around $433,000 in damage to the gas island and vehicles involved. 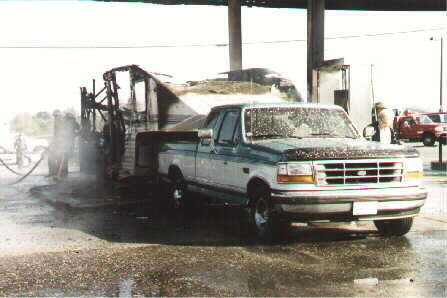 Along with Lamport's truck and camper the fire also damaged a 1993 Honda Civic parked at the pumps. The owner was apparently inside the Flying J store when the blaze ignited.